There is a quite a story behind the woman who inspired the trust; there are chapters that I only know through stories and pictures, but I believe all the stories given my 13 years experience. For me it started when we met at university and settled up north. 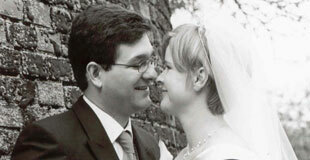 We married in 2001, but our lives were turned upside down when at the age of 28 Nikki was diagnosed with Cervical Cancer. She underwent pretty intensive Chemo and Radio therapy and made an apparent full recovery over the next couple of years. Our eye’s had been opened to the fragility of life, we took nothing for granted and were determined to spend every non-working minute we could with family and friends, ideally in the gob-smacking beauty of our favorite Swiss mountains. But behind it all it was clear to us that nothing was more important than the family that had supported us though the illness and we moved heaven and earth to get closer to them. We made plans to restore an old Windmill Tower on the family plot in Kent, make a home in it and start a family through adoption. It was a long time coming, but these plans started to come together in the summer of 2010. Everything seemed to be working out perfectly especially when George Clarke and the Channel 4 Restoration Man program chose to follow the project. However things started to go wrong in November when Nikki could not shake off a ‘virus’ and after a very tough Christmas she was eventually diagnosed as having a return of the Cancer; this time it was widespread and sadly terminal. You can read the full story here. Nikki lost her fight on the 14th August 2011 at the age of 33; she fought the most amazing battle during which she was so strong, handling the situation with such dignity and as a nurse herself, made a huge impression on all around her. Nikki agreed that we should do everything we possibly could to help tackle this disease. She herself said to her sister “Shelly, what we have to go though now as a family will stop another family going through it instead”. The family and I are doing everything they can to make good on this sentiment and Nikki’s Trust is being setup to promote awareness of and access to the HPV vaccination that can prevent this disease and also for those in Nikki’s position to tackle the unbelievable pain that bone cancer causes. We truly believe that it is possible to make a genuine tangible difference with goals in both prevention and pain control.